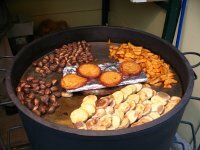 Roasted chestnuts (German: Maroni) are a popular snack in the winter. You’ll likely see more than one “Maronistand” if visiting Vienna during the colder months; these are small one- or two-man stands where chestnuts are roasted on an open drum, and sold in packets to passers-by. Normally, a Maronistand sells roast potato slices (German:Bratkartoffel), potato wedges (German: erm…Wedges) and potato puffs (German: Kartoffelpuffer), too. The stands are commonly found around Christmas markets, at major junctions or outside subway/railway stations. Or at the entrances to major attractions like the zoo or palace gardens. Incidentally, the edible nuts come from the Sweet Chestnut tree, not the Horse Chestnut, and are usually imported from abroad. Through the winter months you can buy them to roast yourself (see below). The horse chestnut is a common tree in Vienna, but they’ve suffered considerably in recent years from the horse chestnut leaf miner (Cameraria ohridella), a moth whose larvae cause the leaves to turn brown and drop early. So if you see a lot of sickly-looking chestnut trees, that’s likely to be the reason. Preheat your oven to about 200 degrees centigrade, around 400 Fahrenheit. Cut a slot in the outer skin of each chestnut. If you leave the nut sealed, the pressure build up can cause them to explode. Spread the chestnuts out on a tray and bake until cooked through and tender (typically around 20-25 minutes). Peel and eat them. The edible part is the soft yellow-whiteish nut inside. 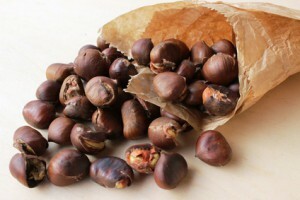 When they come out of the oven or from a Maroni stand, chestnuts are piping hot. Be careful. Take care also to peel away the skin and check for rotten nuts. Chestnuts are a natural product so it’s not unusual to find the occasional rotten one.